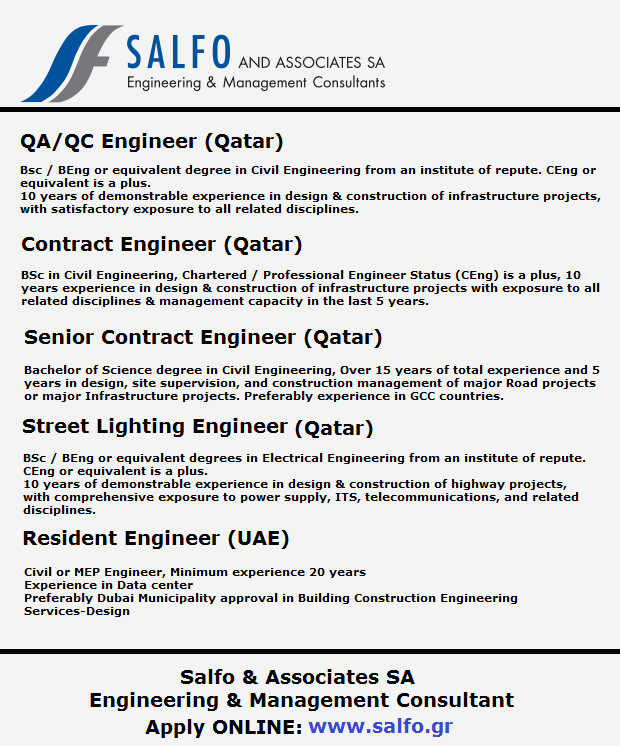 Salfo And Associate SA Engineering & Management Consultant Qatar. BSc / BEng or equivalent degree in Civil Engineering from an institute of repute. CEng or equivalent is a plus. 10 years of demonstrable experience in the design & construction of infrastructure projects, with satisfactory exposure to all related disciplines. BSc in Civil Engineering, Chartered / Professional Engineer Status (CEng) is a plus, 10 years experience in design & construction of infrastructure projects with exposure to all related disciplines & management capacity in the last 5 years. Bachelor of Science degree in Civil Engineering, Over 15 years of total experience and 5 years in design, site supervision, and construction management of major Road projects or major Infrastructure projects. Preferably experience in GCC countries. BSc / BEng or equivalent degrees in Electrical Engineering from an institute of repute. CEng or equivalent is a plus. 10 years of demonstrable experience in the design & construction of highway projects, with comprehensive exposure to a power supply, ITS, telecommunications, and related disciplines. Engineering & Management Consultant, Qatar.